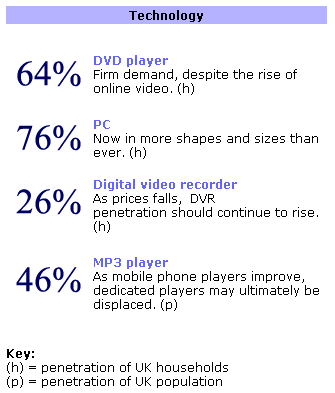 Courtesy of Deloitte's Digital Index. It measures, tracks and explains changes in the consumer take-up of 12 digital products and services, spanning technology, media and telecommunications. 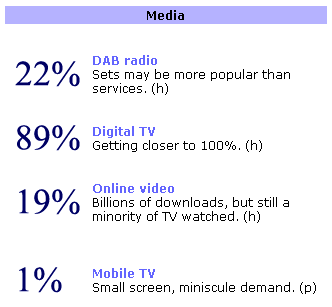 The numbers show adoption of 12 digital products and services as of April 2008. 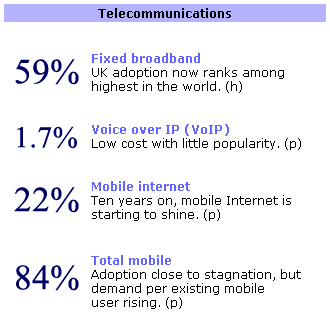 Look out for mobile internet who was at one time 0% in adoption not too long ago, now tracking 22%. This figure will rise very rapid soon with the introduction of lower data plans fuel by better devices and also the iPhone. Its a little surprising that the adoption rate for VOIP is a paltry 1.7% taking into consideration that the technology has been around for 10 years now with so much investments poured into it. I wonder does this index include the Skype service. I m quite sure the penetration for skype service in UK is higher than 1.7%.